Rare Original Photograph Of An American Civil War Union Soldier. The image, taken between 1860-5, is a rare and original photograph. It rests within it original frame with a gilt, oval mount. The back of the frame has a depiction of a harp - perhaps an Irish connection, with a floral border surrounding it. The frame has a width of 3 inches (7.5cm) and a height of 4 inches (10.5cm). The picture measures 2.3 inches (5.75cm) wide by 2.7 inches (7cm) tall. The picture appears to be in excellent condition. 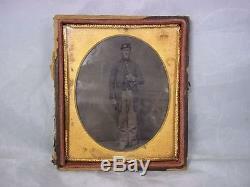 The item "Rare Original Photograph Of An American Civil War Union Soldier" is in sale since Wednesday, January 16, 2013. This item is in the category "Collectables\Photographic Images\Antique (Pre-1940)\Photographs".